2011: The City of Douglas sold at auction the 94-foot Oil Derrick fire tower for $4,010.00. 2012: The City of Douglas again sold the tower, this time for $2,210.00, last years sale apparently defaulted. 1952: A 100-foot steel Aermotor tower with a 7 x 7 sheet metal can was erected. 1973: The 80-foot Aermotor LS-40 tower was moved from the Ila Tower site in Madison County. A catwalk was added when reconstructed. 1928: A 100-foot steel International-Stacey tower with a 7 x 7 steel cab was erected by a private lumbering company. 1938: The 50-foot stone tower was constructed by Civilian Conservation Corps enrollees. The original had a wood and glass observation room on top. A 80-foot Aermotor Model LS-40 tower with a 7 x 7 steel cab. A 55-foot steel K-brace tower with a CL-100 series all metal live-in cab. 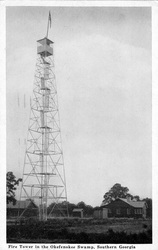 September 2006: The Forestry Commission sold the tower at auction for the sum of $110.00, to be removed within 30 days. 2012: The 100-foot Aermotor MC-40 was sold and will be relocated at the Reynolds Nature Preserve, near Morrow. September 2006: The Forestry Commission sold the tower at auction for the sum of $20.00, to be removed within 30 days. 1942: A 110-foot Aermotor steel tower with a 7 x 7 metal cab was erected. 1956: A 99-foot International-Stacey steel tower with a 7 x 7 cab was erected. September 2006: The Forestry Commission sold the tower at auction for the sum of $600.00, to removed within 30 days. An 80-foot Aermotor Model LS-40 tower with 7 x 7 cab. September 2006: The Forestry Commission sold the tower at auction for the amount of $61.00, to be removed within 30 days. September 2006: The Forestry Commission sold the tower at auction for the sum of $700.00, to be removed within 30 days. 1952: A 100-foot Aermotor steel tower with a 7 x 7 metal cab was constructed. September 2006: The Forestry Commission sold the tower at auction for the sum of $510.00, to be removed within 30 days. A 100-foot Aermotor Model LS-40 tower with 7 x 7 cab. 1928: The first Georgia Forestry Commission lookout was established atop the Ware Hotel in Waycross. September 2006: The Forestry Commission sold the tower at auction for the sum of $660.00, to be removed within 30 days. September 2006: The Forestry Commission sold the tower at auction for the sum of $151.51, to be removed within 30 days.